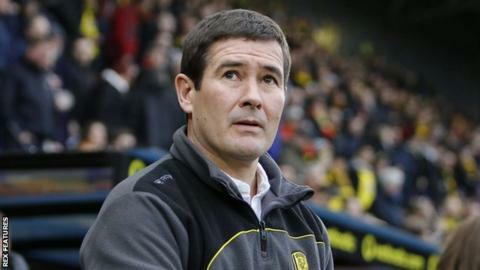 Burton Albion boss Nigel Clough says he would still consider taking over at Nottingham Forest at some stage in his managerial career. Last season Clough turned down the chance to return to the club he served as a player for a total of 11 years, over two spells. The 51-year-old spoke with Forest's previous owner Fawaz Al Hasawi, but wanted to remain loyal to the Brewers. Clough said a Reds return would not happen "in the foreseeable future". His father, Brian, led Forest to the domestic league title and then two consecutive European Cup triumphs during his 18 years as Forest manager. "It's always one day, perhaps, with that sort of thing and the emotional attachment to it," Clough told BBC Radio Derby prior to Saturday's Championship meeting between the sides at the City Ground. "You never know down the line but everyone is just concentrating on the job we have here. "Maybe in about five years' time when Mark [Warburton] has had enough at Forest and the chairman has had enough of us here - although that might be sooner here," he joked. Meanwhile, former Forest defender and boss Frank Clark has been asked to take on an ambassadorial role at the club. Clark managed Forest from the summer of 1993 until December 1996.